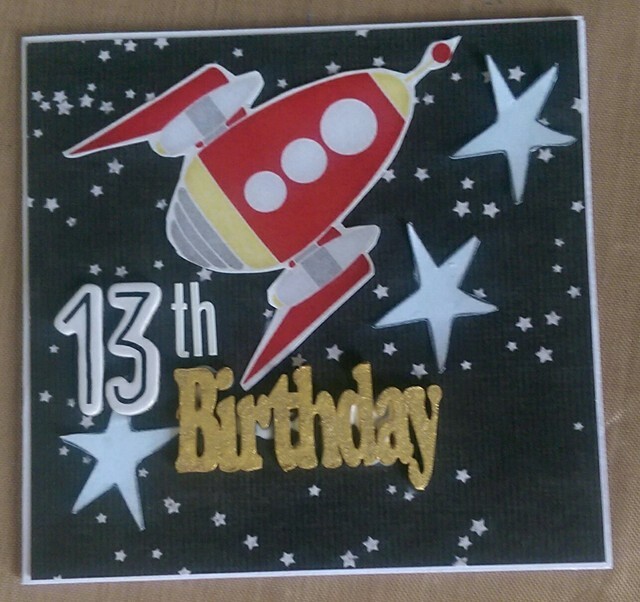 I wanted to quickly share with you the card I made for Mr C's 13th Birthday using the April kit from Scrapping Fun Kits, a kit inspired by Mr C's love of all things STEM/STEAM. Getting this card made without my munchkin seeing it was difficult due to time constraints, so it needed to be a quick project and the kit helped with that need. I used the Rocket and starts from the cut apart and the paper from the kit to create a quick card. The 13 is some old Thickers I got on clearance, the th is from a old alpha sheet I got at a store that was closing down and the Birthday is a Memorymaze Chipboard that had said Birthday Party but I cut the party away and then coloured it with gold paint. There are still a few spots left for April so if you would love a kit head to the Subscription Tab at Scrapping Fun Kits and fill in the form.